Click Here to visit the Center for Interactive Learning and Collaboration (CILC) to register for programs. Select the program you are interested in and click Book it!. Next, you will need to join the CILC if you are not already a member – “Join Now for Free”. Follow steps to book the program. If you have any questions please contact the Virtual Field Trip Coordinator, Jasmin Poor for more information. 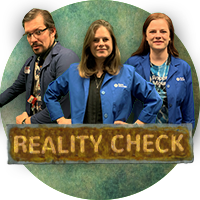 Join our Roper Mountain Reality Fact Check Team. Our episode will tackle one student’s tough question about the cause for seasons. We will compare temperatures and amounts of sunlight received for different parts of the world to determine the cause of the seasons. Obtain and communicate information to describe and compare the biotic factors (including individual organisms, populations, and communities) of different terrestrial and aquatic ecosystems.